The English summer had been a wash out. Apart from a week of brilliant, balmy sunshine in late July, it had been a season of overcast skies, cold winds, and rain, rain, rain - a time of floods and rumours of floods. As August became September, and the children went back to school, the sun came out again, and now it was time for that annual celebration of the English country church, and by extension all things rural and English, the Historic Churches bike ride, which takes place on the second Saturday of each September. I cycled on this day for years, but since starting the Norfolk site I have used it as an opportunity to get round as many churches as possible which are not normally easily accessible. This means heading off in the car with Tom and Peter, belting around the country lanes, avoiding the cyclists. I'm not proud of this, but it would not be possible for the Norfolk Churches site to be so full without it. This year, we decided to take on the northern side of the Yare Valley. This is an area of marshes and tiny lanes, of deceptively remote parishes, given our proximity to Norwich and Yarmouth. 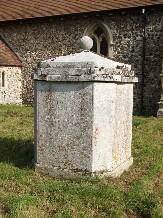 It is also an area of small, pretty churches, with interesting little details. These are the kind of churches I like best. A few days before, Peter had succumbed to illness, and so I just met up with Tom at Attleborough station at about nine o'clock. We skirted the southern side of Norwich on the busy A47. This becomes a shotgun-straight road from Norwich to the coast, a fast and dangerous road which is difficult to cross. And yet, turning off north of it into the narrow lanes, we were immediately swept out of the 21st century into a landscape of hedged-in fields and boiling copses. Although the sun was bright, it had rained overnight, and the fields and hedgerows sparkled and shimmered. The lane narrowed, twisting and turning, and I was glad I had an OS map with me. Indeed, there is no sign for Witton, and nothing for the church, which is hidden up a track behind a farm. You would not possibly come across it by accident. 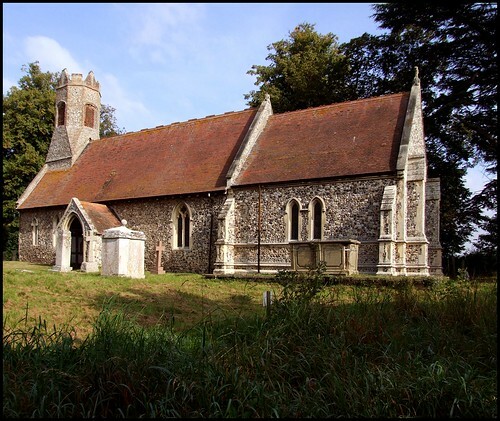 Norfolk has two parishes called Witton, and rather confusingly they both have churches dedicated to St Margaret. This one is sometimes referred to as 'Witton-by-Norwich', but the name was surreal, for it was impossible to think that we were barely ten miles from the centre of that great city. Birds rejoiced in the sunshine - all their lives they must have known bad weather, pretty much, and they were making the most of it. 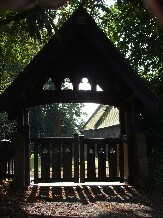 The rays shone brightly through the pretty wooden lychgate, erected on the eve of the First World War. The trees swayed in a fresh, morning breeze. It was a joy to be out in rural Norfolk again. For anyone who has not come across the Historic Churches bike ride before, it is a sponsored event whereby people cycle from one church to another, signing in when they arrive, and getting their sponsor sheet signed by the welcomers. At every church there is hospitality: hot and cold drinks, scones and biscuits baked by someone's mum, and so on. Best of all, the chance to step into the life of another church community, if only for a moment; to stand and reflect, and wander in the ancient sacred space. During the day, a rhythm builds up that is almost a meditation, and the day affirms that we are not alone in our isolated communities and denominations. The event started in East Anglia in the 1970s, and it has spread all over England, but still nobody does it quite like the East Anglians. 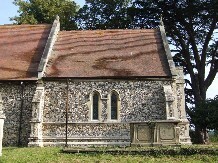 Virtually every church takes part in Suffolk, and in Norfolk there are nearly as many, a good ninety per cent. I was looking forward to the day very much. I was also looking forward to Witton. It seemed a good place to start. 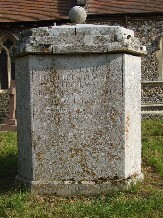 I knew that it contains an extremely rare medieval brass to a vowess, one of only four in England. There is also glass by Hardman & Co, of whom I am very fond. 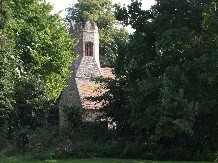 The building itself is rather unusual of aspect; the tower was reduced, and topped off with a little octagonal turret in the 17th century. It seems to grow out of the west end of the nave. The effect is very similar to that at Thurton, a few miles off on the other side of the river. I knew something was wrong as soon as we approached the gate. Where were the welcoming notices, the jolly pink signs that Norfolk churches taking part place in a prominent position to show you the way? We wandered around to the south side, being briefly startled by the extraordinary early 19th century tomb to Mary Taylor, like an enormous stone biscuit barrel. Well, the porch was open, but the door was locked. I felt completely deflated. 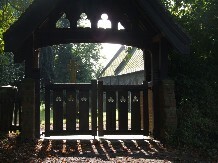 It is not unknown, although most unusual, for churches with tiny congregations, and particularly redundant churches, to be left open and unsupervised on Bike Ride day, but still with provisions and hospitality inside. 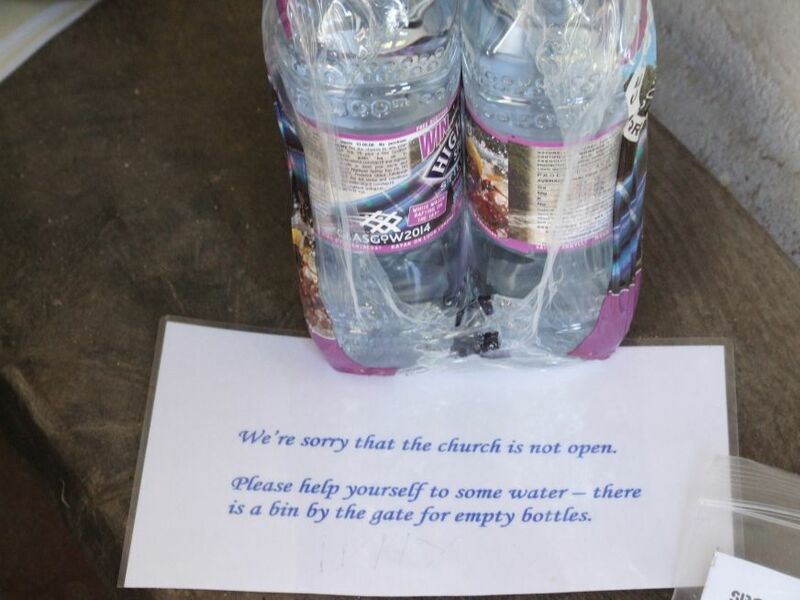 However, a locked church is most unusual, particularly one that claims to be taking part - for on the bench in the porch were two perfunctory bottles of water, and a note reading We're sorry the church is not open. Please help yourself to some water - there is a bin by the gate for empty bottles. This was annoying, especially as it was our first church of the day. As it turned out, this would not be a sign of things to come, but we were not to know that at the time, of course. 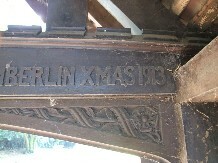 A faded notice pinned to a timber post in the porch indicated that a key was available at the neighbouring farm. 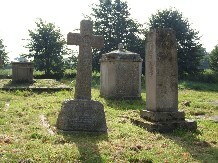 Leaving Tom to inspect the gravestones, I wandered back up the track. I walked between the outbuildings, which were derelict and abandoned, although this is not unusual in rural England, as patterns of farming have been traumatically altered in the last two decades. And then I began to notice that everything was overgrown, a result of the last few damp weeks, no doubt. Rooks erupted from the big trees around the farmhouse. There was a smell of decay in the air. I tugged open a rusting gate, and began to walk up the path - but before I even got there I could see that my journey was pointless. The building was abandoned. The lower windows were boarded up, and upstairs a ragged, dirty curtain boiled from a broken window. The place was utterly desolate. I headed back to the graveyard before the mood of melancholy could infect me. It was a bad start, but the day would bring great pleasures and treasures, and warm, welcoming friendly people. We shook the chill of Witton out of our bones, and headed on to Hemblington.